How can Nutrition cater to our individual needs? About a month ago I gave a seminar on “eating to promote health” to a room full of 30 adults, of mixed age and including both men and women. As I went through BANT’s Wellness Solution Guidelines I was reminded with every question that arose, just how individual we all are. For every nutritional guideline there is likely someone for whom it doesn’t necessarily fit. For example, how much water we each drink daily may vary greatly depending on our individual capacity, desire to drink, health status, thirst levels, body temperature (are you a hot or cold person?) as well as physical activity levels, type of job (manual versus desk), shift workers and length of time spent awake (some people may have an average day from 6:00 to 11:00 whilst others 8:00 -22:00). Each lifestyle factor will have an impact on your dietary habits and patterns. So how does Nutrition cater for entire populations as well as individuals? And how can we define “healthy eating”? 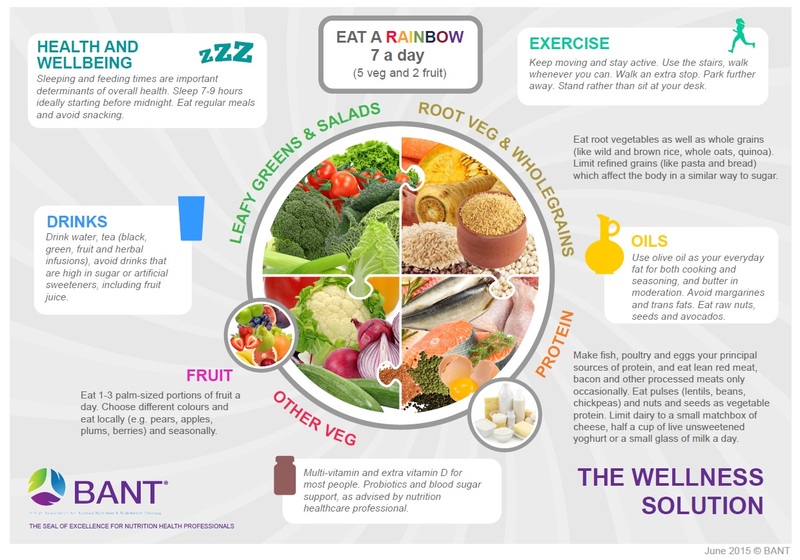 Government Guidelines in the UK are provided by Public Health England (PHE) and are designed to support the general population to maintain an acceptable level of health using their Eatwell Guide. The guide gives broad recommendations on average energy requirements (eg. calories) for children, teens and adults, as well as guidance on what kinds of food to aim to include in your diet. However, we continue to see a rise in obesity (both in children and adults) and UK obesity prevalence has increased from 15 per cent in 1993 to 26 per cent in 2014. Similarly, a 2014 European cohort study conducted in seven EU countries found 17% of 163,517 individuals included in the study were obese (1). At the same time other chronic diseases continue to rise, such as Type II diabetes, fatty liver, cardiovascular disease, hypertension, hyperlipidemia and other metabolic diseases. It is clear that something is not working. Nowhere in this equation is the individuality of the patient accounted for. Is Personalised Nutrition a realistic solution to the current health crisis? The leading Nutrition Associations (BANT, BNF )and Dietetic Associations (BDA) offer variations on the government guidelines detailing more clearly the principle of healthy eating which can be applied to the general population. Most people can benefit in some way from adopting a more balanced diet, rich in wholefoods, fruits and vegetables, lean protein, fish and healthy fats. Personalised Nutrition can then be applied by seeing a Registered Nutritionist or Dietitian for one-to-one consultation and a deeper look at the individual’s lifestyle and dietary habits. In this forum, all of the factors unique to that individual can be accounted for in planning their nutritional program. It’s a little like fine tuning an instrument, and helping each individual to find their optimal level of health as opposed to the “acceptable level” mentioned earlier. Let’s be clear, it is a slower approach. However, the time invested in each individual and the educatory nature of a personalised approach showed in a 2016 study that “Optimal nutritional choices are linked with better health”. The study participants who were offered a continual dietary support had improved health outcomes compared to those without that support. So how can we embrace our uniqueness and be healthy? Understanding our individual makeup is as much a part of our overall health picture as our actual diet. Many lifestyle factors can influence how our digestive system performs, our ability to handle stress, the pattern of our hormones, and our quality of sleep, to name just a few examples. Connecting the links between lifestyle patterns such as physical activity levels, medication and antibiotic use, or high sugar diets with physiological symptoms of fatigue, poor memory, and digestive disturbances is part of an applied and personalised approach to nutrition. In this way, healthy eating becomes targeted to “healthy for you personally” and broad guidelines can be refined to the individual. It may not be the only solution to a growing health crisis. It can however play an integral part in supporting meaningful change one person at a time.